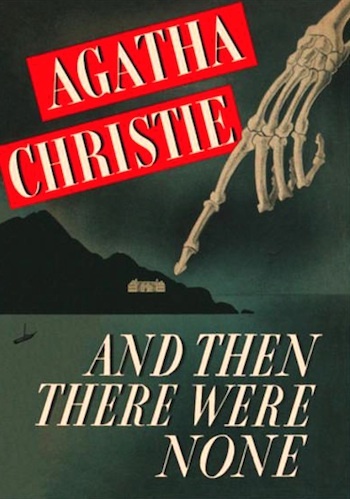 Whether you have never read Agatha Christie or would like to explore her work a little further, here is a selection of her novels that should give a good idea of the nature of her work and whet your appetite for more. Each of these mysteries also has a particular flavour and emphasis which gives it an individual appeal. Perhaps you love logic and puzzles. Maybe you like stories of passion and romance, or are interested in the criminal mind. 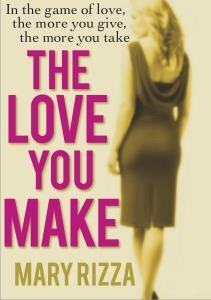 You might be intrigued by family secrets and relationships. Here’s one for all you lovers of detail and order (rather like M Poirot himself). 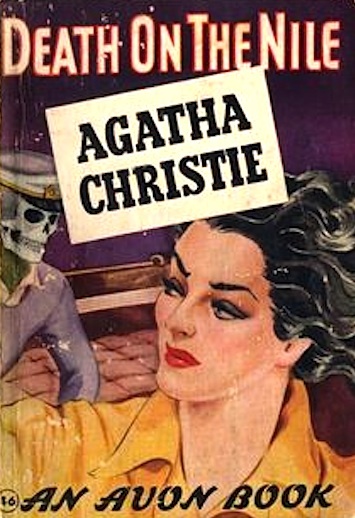 Christie’s 1926 novel is seen as a cornerstone of crime fiction for its structure and narrative voice and its unexpected twist. 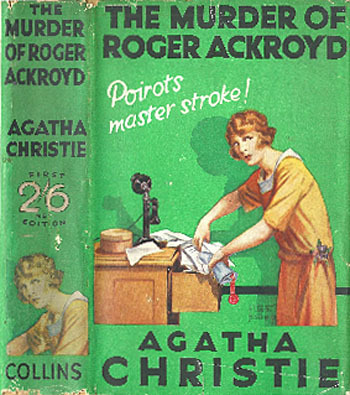 The set-up focuses on Roger Ackroyd, who is killed to stop him disclosing the identity of a blackmailer. The local doctor guides us through the dramatic events which take place in the village of King’s Abbott, and he also fulfils the function of being Poirot’s guide and assistant in the investigation. 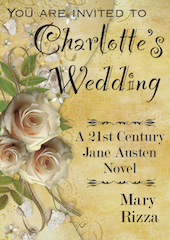 The story is full of drama and melodrama — poison, stabbing, secret marriage, wills, inheritance, blackmail, illegitimacy. But the mechanisms of discovering the truth hinge on dry and unemotional issues of times and places, of precise observation, of using logic (the famous ‘little grey cells’) to narrow the possibilities down until only one possible solution remains. There are many significant references to time — the 10.19 train, the 10.23 train, the number of minutes it takes to reach a destination by various routes, the exact hour at which someone left the billiard room, or went to the butler’s pantry, or went into the garden. For contemporary readers, this may provide a quaint view of a world in which public transport timetables were not light works of fiction, and which required people to be more time-conscious in their daily activities. In the techno-digital age, there’s no real necessity to observe the ‘Hurry up, Game Of Thrones is just starting!’ moment. The murder is a mystery which invites you to draw diagrams (a couple are provided in the text), make timetables and check facts. And see if you solve it at the same time as Poirot. This is the one about passion. We start with two Best Friends Forever, Linnet and Jackie. They’re in their late teens, just pushing 20. Linnet is mega-rich. She’s inherited oodles of cash which she enjoys spending. She’s smart and generous. She’s also a drop-dead gorgeous blonde. Linnet’s combination of money, looks and charm means she always gets what she wants. Well, nearly always. The only thing she doesn’t have is The One. 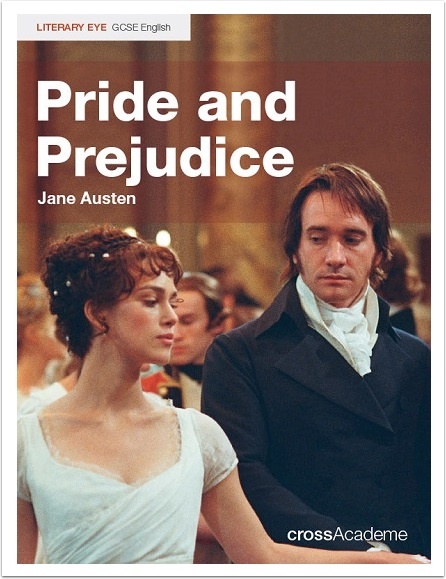 There is a suitable man who wants to marry her, but she’s just not that into him, and anyway, marriage would mean giving up being in charge of her own country mansion and becoming mistress of someone else’s — problems, eh. Jackie isn’t rich. 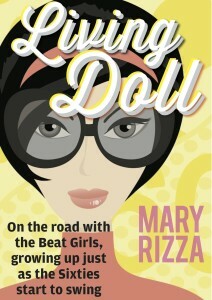 Her car is a dilapidated two-seater, as opposed to Linnet’s scarlet Rolls Royce. And — horror — she has to work for a living. But Jackie has found The One. He’s called Simon, and she absolutely adores him. She loves him so much it scares her. She introduces Simon to Linnet. Oh, you’re ahead of us. You’re right. In no time, we’re in a Taylor Swift song. Linnet and Simon are married and on their honeymoon in Egypt. Oh, so is Jackie. Claiming that Simon belongs to her, she stalks their every move with a small pearl-handled pistol stowed in her little silk bag. The cruise ship is crammed with lively characters, including a jewel thief, a blackmailer, a political agitator, a shady moneyman, a posh boy pretending not to be. And a few of them find romance on board, with some very satisfying pairings-up at the end providing a counter-balance to violent crime. This 1950 novel raises intriguing issues of character and identity, enjoyably wrapped up in a story of murder in the village of Chipping Cleghorn. We are in a world where no one can be sure if people really are who they say they are. Villages and small towns in post-war England no longer have the old settled populations in which everyone’s background is well known. Who is the man with the revolver who places the murder advert and shoots the revolver? Are the young cousins living at Little Paddocks using assumed names? The village is teeming with single women, whose relationships are presented with humour and understanding. We have two pairs of women friends, and in each pair one of the women is murdered. The first couple are old school friends Blacklock and Bunner, the former a competent tweed-clad 60-year old, the latter her muddled, loyal, impecunious friend with whom Blacklock shares her home, to save her from a most dreary life of poverty. Providing a neat parallel, spinsters Hinchcliffe and Murgatroyd, who run a smallholding, are a one-strong, one-weak couple. Miss Hinchcliffe wears corduroy trousers and has a short man-like crop and weather-beaten complexion. She sees to the slaughtering of their pigs, and has clandestine arrangements about food with the local farmers. (England was still on food rations in 1950). She looks after her sweet, less confident friend with gruff affection. In a tantalising throwaway line, we are told that Hinchcliffe was ‘brought up by grooms in Ireland’. Now that deserves a spin-off novel, or at least a mini-series. Frances Barber was pretty fab as Hinchcliffe in one of the television versions…. 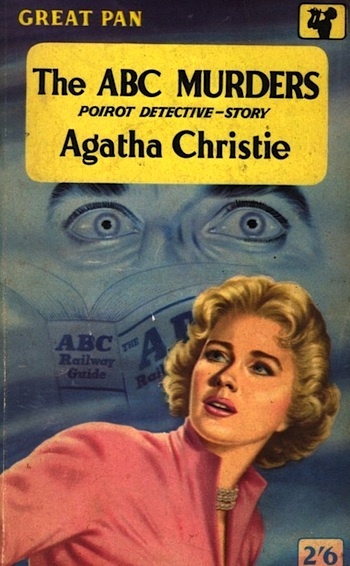 Crime fiction teems with serial killers and their psychological profiles, and Christie’s 1936 novel is an intriguing early example. Reading it, you can feel yourself becoming an expert, giving ‘yes of course obviously’ nods to theories about the killer’s psyche — the desire to draw attention to himself through anonymous letters, his over-weening pride and confidence, his insane egoism, his need to over-compensate for his personal inadequacy. Oh, we’ve got you, mister. But Poirot is on the case. The first aspect which engages his brain is the nature of the victims — and it is this very point that illustrates the lack of prurience in Christie’s work, making her a more comfortable read than her tougher counterparts. Those who are killed aren’t all young and female, and their demise is not presented in graphic detail. Instead, we have an apparently random selection of victims, chosen from particular locations, Andover, Bexhill and Churston, all in the South of England. Spot the initial letters of the towns? But we know this case will be solved before too long, and not just through Poirot’s brilliance. There isn’t an English town or village beginning with the letter X. 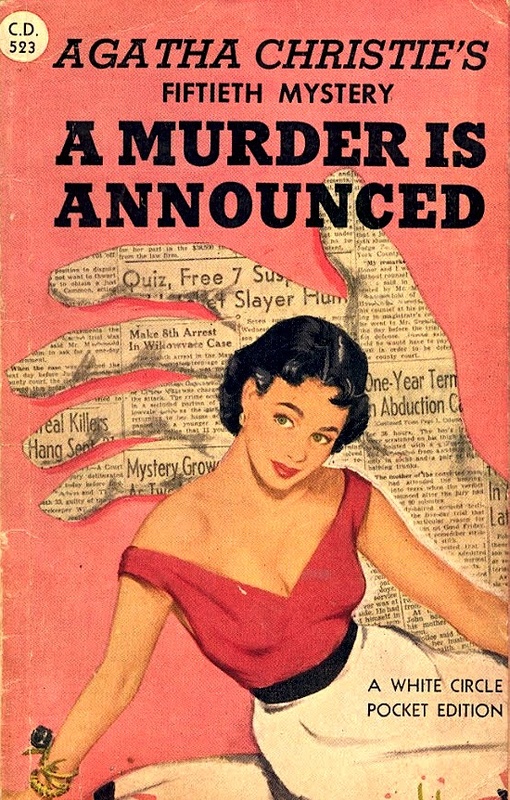 A nail-bitingly great mystery. 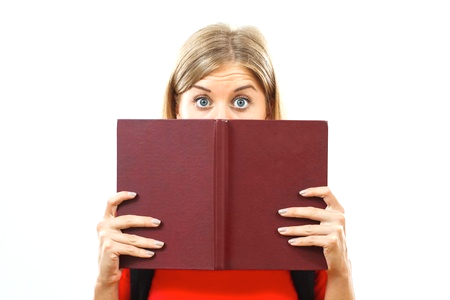 You have to read it — it’s said to be her most baffling mystery, and is the one she found most difficult to write. 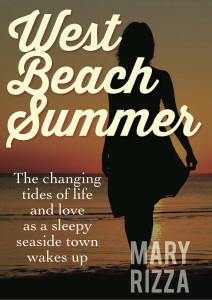 A group of strangers are brought together on an island off the Devon coast, each with a murky back story. They have been invited by someone with the name U. N. Owen. Go on, say it out loud. The realisation that no one has met this person, and that there is no way off the island, is chilling enough. Then at dinner on the first night, a voice which seems to come from the walls list each guest, and names the individuals each is accused of having killed. Oh dear. The island doesn’t seem so glam now, in spite of the rumours that it is owned by a Hollywood film star or an American millionaire. The perpetrator must be one of their (ever dwindling) number. But who? The story unfolds at a cracking pace, with the atmosphere of fear and paranoia reaching almost unbearable heights. Don’t try reading it by torchlight.